This recipe has been around pretty much my whole married life. If there is a turkey on the table, there is cranberry crisp next to it. It originated from my friend Karyn, and we even make it for Passover with matzoh farfel. It’s so sweet and delicious that it could really be a dessert. We love it with our meal; love the sweet and savory thing. You can’t eat too much of it, it is so rich. It is also very dangerous to have in the fridge the next day, so try to give it to everyone who wants to take home leftovers. This tastes good either hot out of the oven or at room temperature. Some people may even want to make it as dessert and serve with vanilla ice cream, but the Kolens don’t. We always serve it as a side dish and it is awesome however you serve it. Thanks again, Karyn. Preheat oven to 350 degrees and spray 9×13 baking dish with Pam. Peel apples, slice them, then arrange in baking dish. Sprinkle with cinnamon. Spoon cranberry sauce over the apples. Separately, stir rolled oats, flour, and brown sugar together. Cut in butter until it’s mixed in and crumbly. Sprinkle this over cranberry layer. Bake at 350 degrees until apples are cooked and top is lightly browned. The entire mixture will be bubbling and your house will smell divine. You will bake about 40 minutes to an hour. You can make ahead of time, and then on the day you need it, just heat it up until it bubbles. I usually make this a few days ahead, because it’s that much less that I’ll have to do the day of. You can freeze this also, so make it way ahead and freeze it. If you freeze it, take it out a day before you need it, and then heat it up the day of. 350 degrees with foil for first 30 minutes and then uncover for 10 or so minutes. *Hint — the butter is easier to fold into to the oats if it’s melted, so that’s what we do . Melt it in the microwave for like 10 secondsThen use your clean hands to squish it together. It is easier to work with this way. If you d0 it the other way , it’s OK, it will all come out the same, just easier to melt first, sorry I didn’t suggest that from the get go. 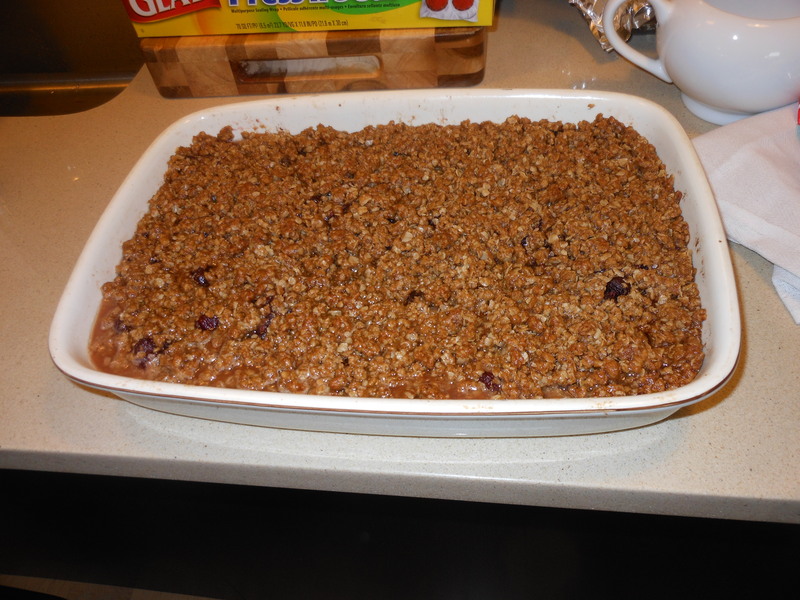 This entry was posted in sides, vegetarian and tagged Cranberry Apple Crisp, Cranbery Crisp, Karyn's Cranberry Crisp -Thanksgiving, Karyn's Crisp, Thanksgiving Cranberry Crisp. Bookmark the permalink. Candi, what adjustments need to be made for high altitude baking on this? Thanks so much! Looks yummy! Thanksgiving would never be complete without this wonderful recipe. It can be dessert or a delicious sweet side dish. We eat it with the meal and it’s always on our table! Happy Thanksgiving! it is one of so very many side dishes and if I have 20 people or so I double it. You should be good with that. Enjoy!